Good morning friends. Today's good news for us. MCX- Gold, Silver, Aluminium, Copper, Nickel, Lead, Zink all are open at positive response. But Natural Gas are also move up-down in some time. And Crude Oil, Mentha oil, cotton are open at negative zone. But its good news for us, most of the metals are getting above points. 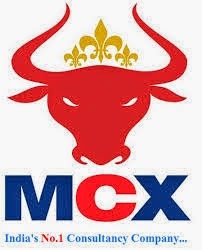 MCX Gold has trade Rs 28028, MCX Silver has trade Rs 44452, MCX Aluminium Rs 120.1, Copper trade Rs 432.05, Nickel trade Rs 1150.4, Lead trade Rs 136.25, Zink trade Rs 144.4. Its all of the move above side. But MCX Crude Oil trade Rs 6120, Mentha oil trade Rs 699.1, Cotton trade Rs 18090. Its all are in move down side.